Our bird dog came into this world before we even knew we wanted him. He was born at the base, of a steep butte, near Emmett, Idaho. My husband said we could get one of the males just as long as we could name him Angus. 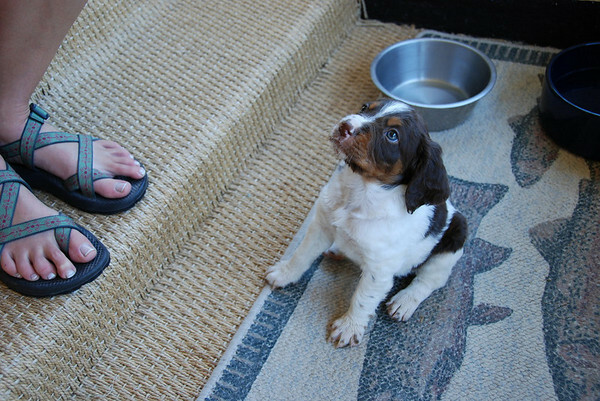 We picked him out of his litter of ten on a hot July day and brought him home to join his new sister Glenna, another purebred Brittany. 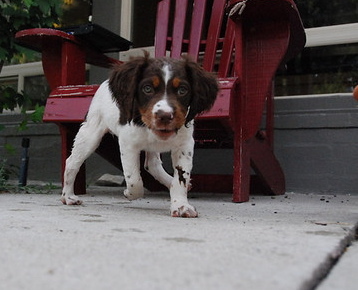 Angus was full of energy and mischief and did all the usual puppy things growing up. The breeder assured us that he was one of the mellower ones of the litter and I seriously doubted his judgment about this high energy, cute little bundle of fur, wondering if we’d made the right decision to get this particular one in the first place. After surviving those first two years, we knew we made the right decision to keep him. 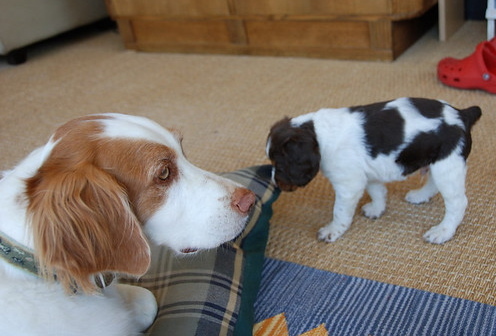 Big sister Glenna and Angus. She hated him at first but warmed up after about two weeks. Okay, I know what some of you are thinking: why not just get a rescue dog or mixed breed dog instead of a purebred dog from a breeder. I’m 100% in favor of rescue dogs and like mixed breeds. In the past, I’ve volunteered with dog rescue groups, fostering dogs and finding homes for retired Greyhounds fresh off the track, and I’ve donated money to plenty of animal shelters. 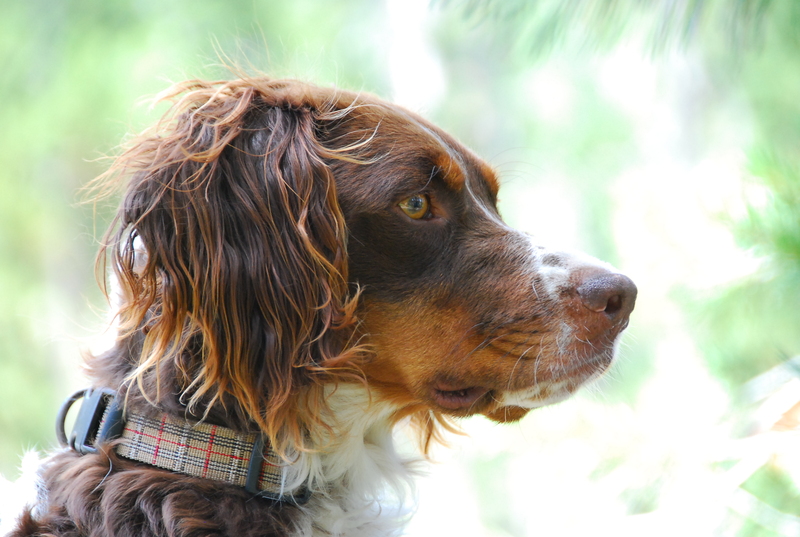 Sometimes you just get partial to certain breeds, whether it’s because you grew up with that breed or because you are looking for certain genetic traits. 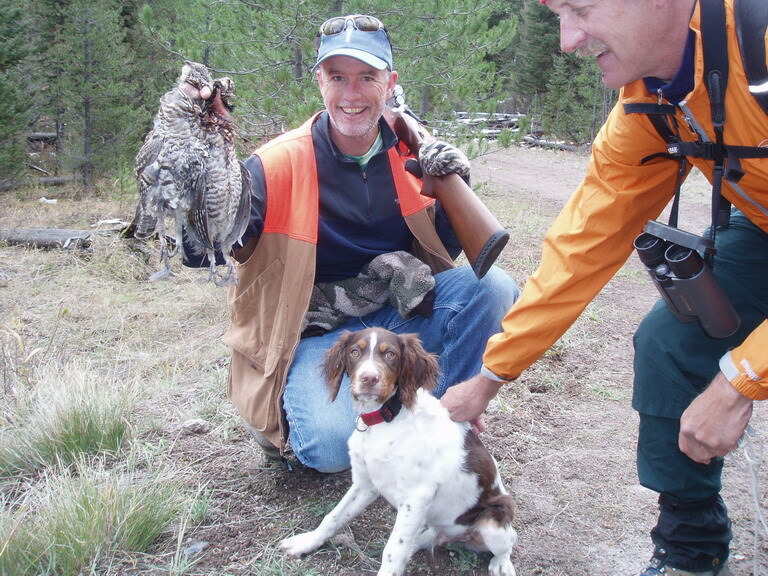 Our Brittany, as well as other types of bird dogs, is somehow genetically wired to find birds, point them, sometimes flush them, and retrieve them after they’ve been shot. 5 month old Angus and his first taste of bird hunting. He retrieved one of these grouse. Angus loved sleeping next to his older sister. Glenna died unexpectedly about a month after this photo was taken from complications of mega esophagus. After Glenna died, Angus became his own dog and excellent hunter. My husband goes out bird hunting late fall and early winter while I tag along with the camera. 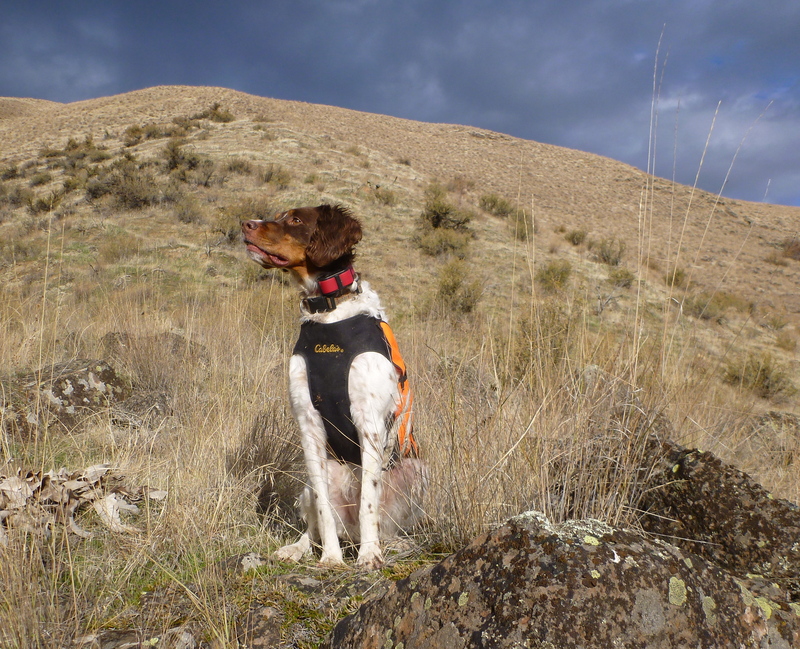 We go up and down the steep mountains and hills of Idaho looking for chukar. It’s a beautiful thing to watch a bird dog work, which for me is the big draw to the sport of bird hunting. 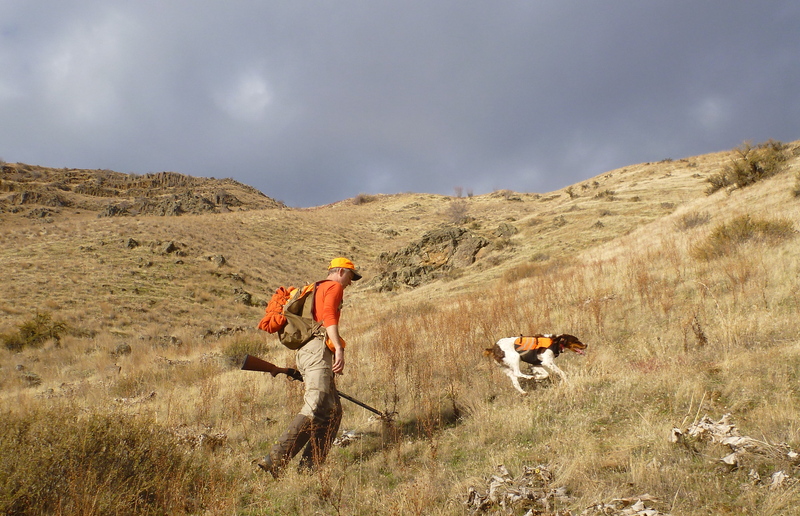 Hunting near Hells Canyon. Angus wearing the vest to keep cockle burs off his chest and to make him visible to big game hunters who might be in the area. Angus in the field, always looking, listening, and smelling for birds. In the field Angus is so focused and skilled at his job for the day that you forget that at home he’s that super sweet dog family dog. Despite all his excellent hunting qualities and our desire to clone him, he still pisses us off every morning when he wakes us up at five o’clock for his 1/2 cup of kibble just so he could go back to bed to sleep in for a couple more hours. Below is a video clip from a recent hunt. Warning: the music is loud (mute if you want to be quiet). The video will give you a small sampling of what chukar hunting with a bird dog is all about. One of these days I’d probably get a rescue Brittany that’s not trained to hunt. But Angus is in his prime right now and the season has only three more weeks. Time’s a-wastin’, let’s get out there! Reblogged this on Chukar Hunting. Outstanding Post!! I really enjoy your blog. This is good stuff. Travis, thanks for the very nice comment!